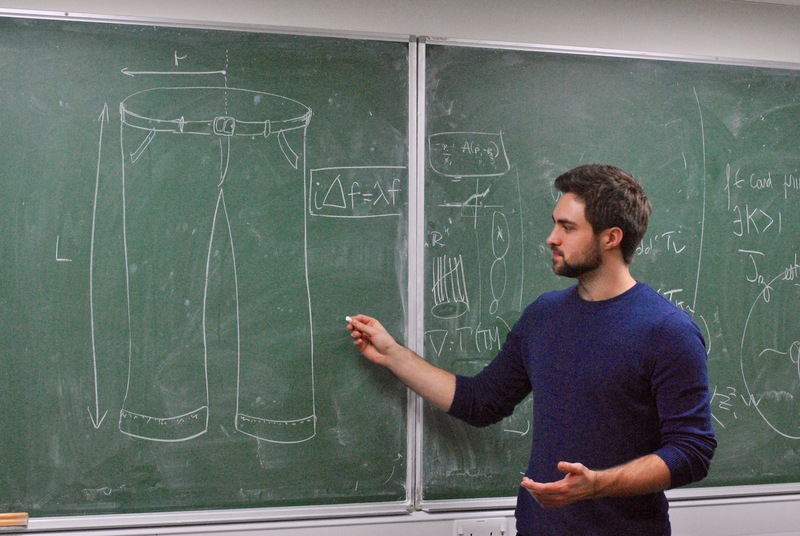 One of the authors, Ian Jubb, discussing a pair of trousers with his colleagues at Imperial College London. Ian Jubb is currently the PhD student of Fay Dowker in the Theoretical Physics group at Imperial College London. by Ian Jubb and Michel Buck. Did you know that Quantum Gravity literally sets pants on fire? Your pants are not just a nifty garment, they are also a perfect example of a space undergoing a process known as topology change. Take a space that initially consists of two separate circles. If they were to meet and merge into a single circle, the topology of the space would have changed. The trousers allow us to visualise each stage of this process, with cross sections higher up the trouser leg corresponding to later times in the process (if we hold the trousers upside-down, we get the reverse process, corresponding to a single circle splitting into two circles). Instead of viewing this process as the space changing in time, Einstein would tell us to view the trousers in their entirety, as one whole spacetime — the trousers spacetime. But why should we care about spaces that can ‘split’ and ’attach’ like this? It turns out that there are good reasons to believe that such spacetimes may have a role to play in Quantum Gravity. In the gravitational path integral, where we sum over different spacetimes, structures on Planckian scales incur very little suppression, which suggests that spaces undergoing topology change should be included in the sum over spacetimes. In our recent CQG paper , we focus our attention on the trousers, as it is one of the simplest examples to study. Figuring out how the trousers and other spacetimes with topology change contribute to the path integral is tricky work. As a first step, one can take a background field approximation and look at linear quantum fluctuations about the classical spacetime. We looked specifically at the quantum field theory of a free massless scalar field in a fixed, background trousers spacetime. Anderson and DeWitt were first to try on the trousers, albeit upside-down. They wrote down the modes of the massless field theory in the waist region, and proposed a rule to propagate these modes down the legs. They concluded that the vacuum state of the quantum theory would bring with it an unavoidable infinite energy burst from the crotch. This blazing inferno emanating from the crotch at light-speed, they argued, suggests that the topology change occurring in the trousers spacetime is unphysical. Manogue and others revisited the problem with a more careful analysis involving propagation rules that conserved the Klein-Gordon inner product. Nevertheless, their conclusion with regards to the infinite energy remained the same. Recently, Rafael Sorkin has proposed a new approach to QFT based on work by Stephen Johnston on Quantum Field Theory on causal sets. In our paper we apply this Sorkin-Johnston (SJ) formalism to the trousers, not only to see what light it might shed on previous results, but also as an exercise in the new approach. With the SJ formalism we were able to confirm the previously found infinite energy, and answer some of the questions left open in previous work using traditional QFT techniques. This could be just the beginning for the new SJ formalism. In the future it may allow us to ask about quantum effects in other topology changing spacetimes. We’re particularly interested to see if we can find spacetimes with topology changes that don’t result in hellfire, such as the spacetime representing black hole pair production in 4 dimensions. Unfortunately, we don’t know of a garment that will help you visualise that. This entry was posted in Author Insights, IOPselect and tagged quantum field theory, quantum gravity, spacetime by Jennifer Sanders. Bookmark the permalink.